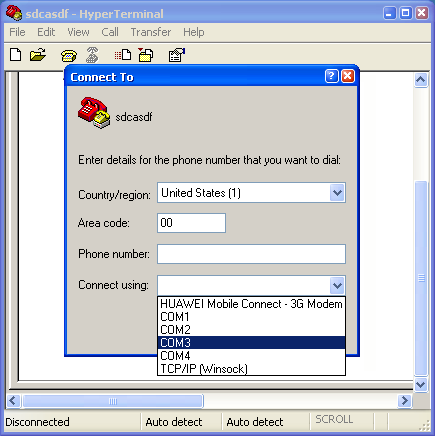 Launch HyperTerminal (Start – Programs – Accessories – Communication). Some new MS Windows versions (e.g. Windows 7) do not include HyperTerminal – so you have to download some analogous program. In the Connection Description dialog, fill in the connection name and select its icon (optional). In the Connect To dialog, select the proper COM port from the Connect using list. It is important just to select the proper COM port as all other fields are grayed after this port selection. In the COM x Properties dialog, review and confirm default settings. Write ate1 and press the Enter button. This command evokes an echo – you should get OK as an answer. Write at+cpms=? and press the Enter button. If you get some non-empty specification (e.g. +CPMS: ("ME","MT","SM","SR"),("ME","MT","SM","SR"),("ME","MT","SM","SR")), continue to point 5. Write at+cmgl=? and press the Enter button. If you get some non-empty specification, your device is high likely going to work with IceWarp Server for receiving SMS messages. Follow steps # 1 – 3 of the previous scenario. Write at+cmgs=? and press the Enter button. If you get OK, your device is high likely going to work with IceWarp Server for sending SMS messages. In the administrative console, set an SMS gateway for the appropriate COM port. Do close the console (if open) and save the smsgateway.dat file. Launch the console again and check SMS logs for the answer (Status – Logs – Service: SMS). It means that the gateway can send and receive messages.